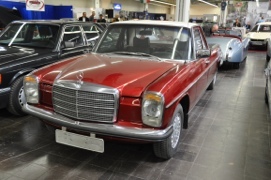 Starting with the pretty Mercedes-Benz W114 200. 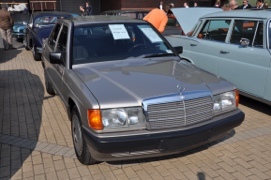 We never officially got these cars in the US, and the W114s we did get certainly didn’t come with those cool upright European headlights with wipers. Very cool. 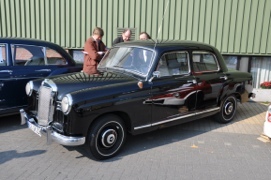 The condition was exemplary, looking almost like a brand new car. Unfortunately, or fortunately, this seller didn’t bother sharing either his price or contact information. Maybe he wants to let the excitement build? 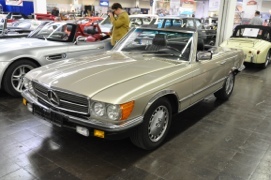 Mercedes-Benz cars dominate the seller lots, but they’re not the only cars for sale. 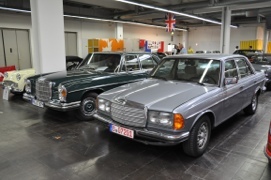 Nonetheless, this pair of beauties – a 300SEL and a 280CE are also unique. 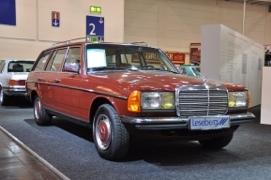 The 300 is unusual in that it has top spec equipment like sunroof and power windows, yet is equipped with a very late-60s chic brown plaid interior. 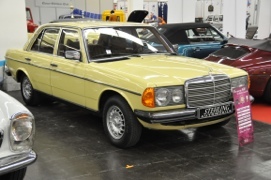 Although we got the pretty Paul Bracq-designed coupe stateside, Mercedes never imported it with the fuel injected version of the M110 DOHC inline-6 cylinder. 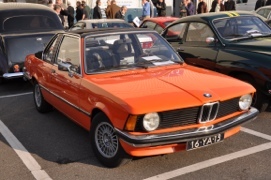 The two-tone exterior is another story altogether, but somehow works here. 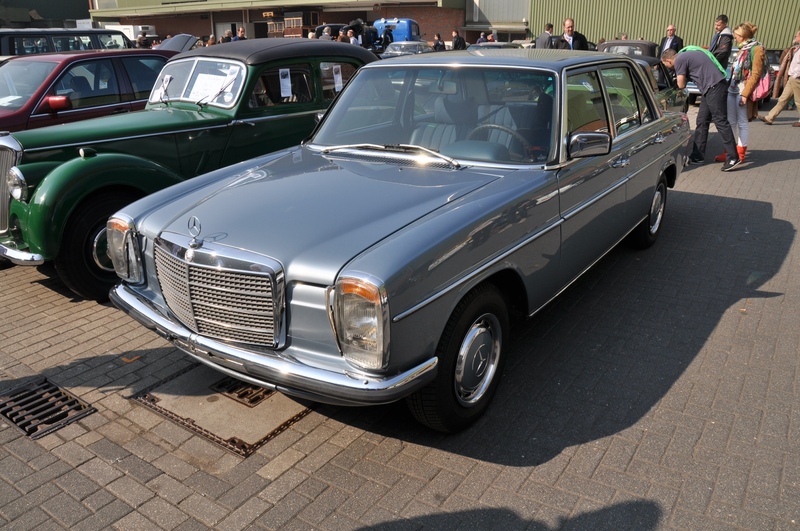 Who doesn’t love a Mercedes W123? Well, I know one guy, but he doesn’t count. 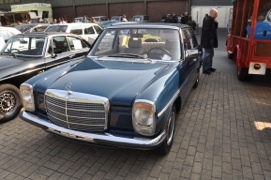 The W123s were out en masse in the various vendor lots and displays and in every color you can think of. 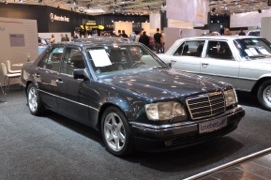 Prices ranged from a low of 5,900 to 25,900 Euros. Some very nice cars. 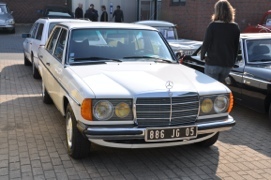 My favorite has to be the french market car with the cool and nearly impossible to source yellow headlight and driving light reflectors. 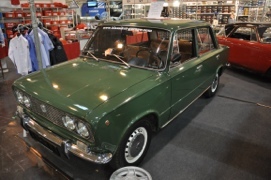 Or maybe the Thistle Green metallic 280E. I do love Thistle green. 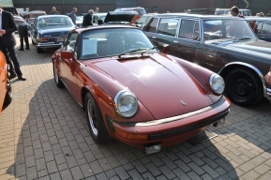 Among some of the non-Mercs for sale, I spotted what I thought was a very nice Porsche 911SC. 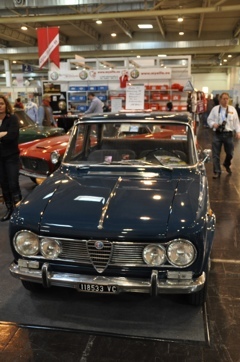 I love the Euro headlights on those cars in place of the US sealed-beam units. 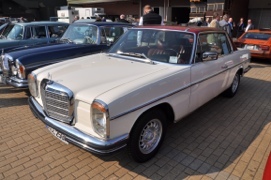 The funny thing is, though, when I got to the back of the car, it became obvious from the fat bumper overriders that it was actually a US-spec car. 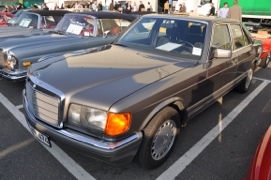 On further investigation it turned out that it was a California car sent over in the mid-1990s. 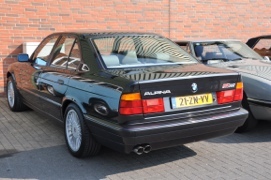 After yesterday’s feature on the 1990 Alpina B10 Bi-turbo, this B10 Allrad caught my eye. Sadly, and I knew this already, it’s not over 25 years old. 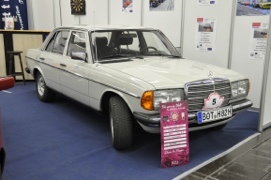 This one is a 1993 model, for sale for a fairly reasonable 13,900 Euros. Then there were the Italians. 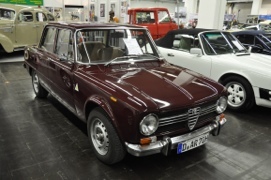 Two Guilia TIs, two Alfettas, and a Fiat 128 sedan all caught my eye. We got versions of all of these cars, but finding good ones now is nearly impossible. 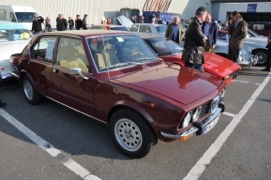 The Fiat and the red Alfetta were the better deals – clean cars both well under 10,000 Euros. The Guilias command a premium here just as they do at home. Still, they are so darned pretty. 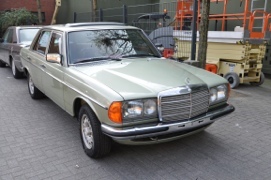 This assortment of other available cars includes among others a handful of interesting gems, among them: a BMW-Baur 318i, a Mercedes W126 300SE with cloth interior and the full assortment of options, a German-market R107 280SL strangely converted to US-style (!) 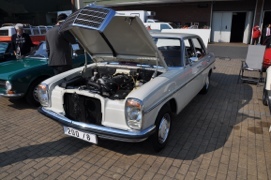 headlights, and a beautiful W114/W115 Mercedes 280E stricht-acht with a manual transmission, air conditioning, sunroof, and like-new cloth interior. That last one would be the one I want to follow me home. Strangely, as opposed to past Essen shows I’ve attended, Porsches and BMWs are seemingly nowhere to be found in the vendor parking areas. Must be time to start scouring the outside parking lots! 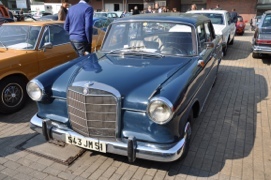 In any case, there are certainly a lot of interesting cars to be found here for those of us smitten with our vintage German cars. 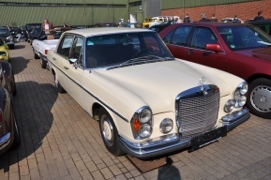 There is also some far more exotic stuff available, but we’ll save that for another day’s blog! 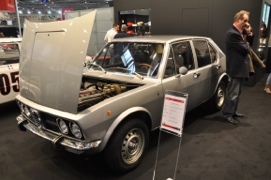 This entry was posted on Wednesday, March 21st, 2012 at 1:30 PM	and tagged with 124, 3-series, Alfa Romeo, Alfetta, Baur, BMW, E34, Fiat, Fintail, Giulia TI, Heckflosse, Mercedes-Benz, Ponton, Porsche 911SC, Techno Classica Essen, W108, W114, W115, W123, W126 and posted in Dealer's Lot, Totally That Stupid. You can follow any responses to this entry through the RSS 2.0 feed.